Nowadays, running a small to medium sized business takes more work than it ever has before. But that's okay, because there are plenty of helpers all around the world, waiting for you to hire them at very affordable prices - all you have to do is ask! Even if all you can do is offload one task a week, if that task takes up an hour or two of your time, that's between 50 and 100 hours a year that you could spend doing whatever it is you want to do. I read The 4-Hour Workweek a few years ago and didn't really buy into the idea of outsourcing my life so that I could ride a motorcycle through China. Sure it sounds like fun to do nothing but play during my time here on earth, but I want to have some meaning to my life! So I foolishly discounted the concepts that Tim Ferriss was trying to teach, and went on my merry way. But then I saw a video of Pete Williams talking about those same principles found in The 4-Hour Workweek. Pete's an Australian entrepreneur who uses those concepts not to necessarily outsource his life away so that he can go tango in Argentina, but so that he can focus on doing what only he can do to grow his businesses (yes, he has several). After I watched his lecture series, I realized that I misunderstood what The 4-Hour Workweek was really trying to teach me - it's not about living a vacation for the rest of my life. It's about building successful businesses by creating a team of workers who can take care of the mechanics while I focus on the core of my business. It's about getting my workweek down to 4 hours of dealing with mechanics so that the rest of the week I can focus on doing what only I can do to grow my business. And if my processes are solid, and the documentation of those processes is easy to access and easy to follow, then that team of workers doesn't even have to be in my office - they can live on the other side of the world, working at a very affordable price. For a small to medium sized business with limited funds, that's huge! If you're new to outsourcing/out-tasking, I've outlined 4 easy steps to help you get started. What I've learned is that building a successful team takes time, and it's not going to be perfect on the first attempt - it's a journey. And like every journey, you have to start somewhere. So start here, right now. Think of one thing you need done that somebody else could do. Maybe it's transcribe audio. Maybe it's editing video footage. Or maybe it's making cold calls using a script. Whatever it is, follow these four steps to get going. 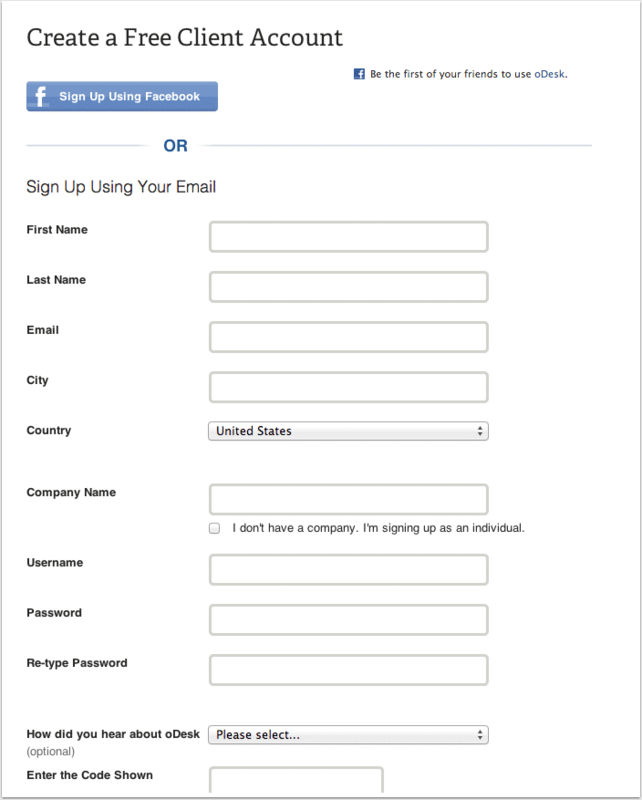 Creating an account is incredibly easy, especially if you have a Facebook account. 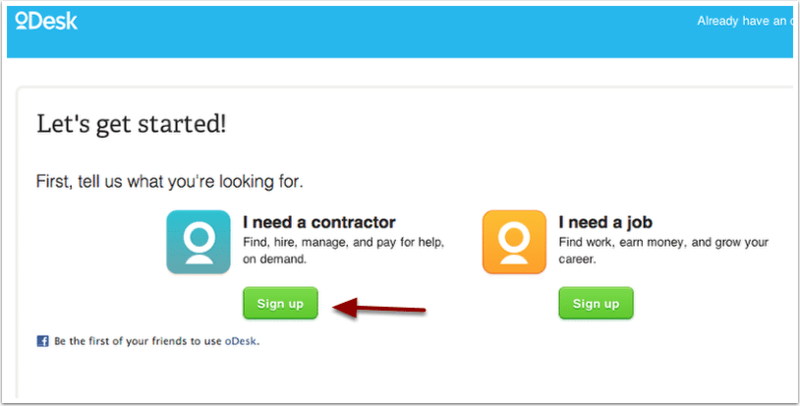 Go to www.odesk.com and click "Sign up"
Then click "Sign up" under "I need a contractor." Create a Free Client Account (I just used Facebook to sign up). That's it! After you confirm your account from the email you were sent from oDesk, you now have an account. Now, let's post a job. Posting a job is easy and requires zero commitment. 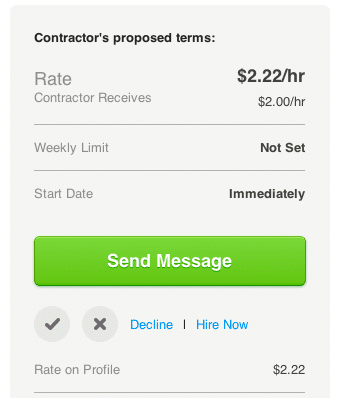 You can either hire at an hourly rate, or just hire for a flat fee (e.g. $100 for a logo design). 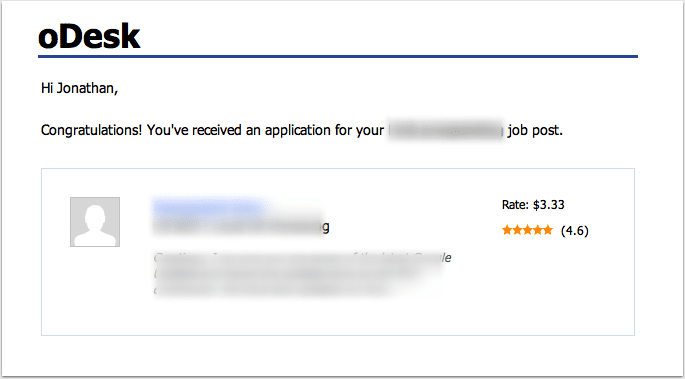 My advice is if you're posting a job for the first time, start with something small, something simple, and something that isn't going to break the bank. 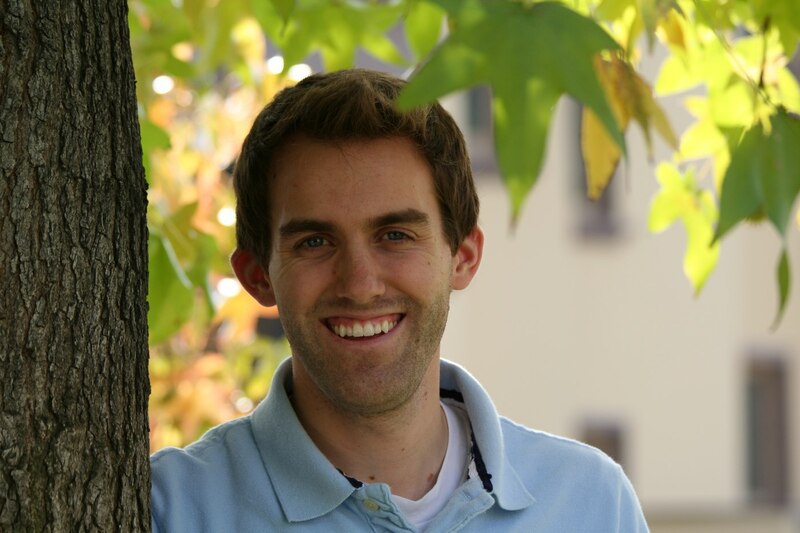 The first job that I posted was a simple task - transcribe audio from an interview that I had recorded. I just wanted to get used to the process and get the hang of how to hire somebody before I began outsourcing bigger jobs. The example in the picture below is from a template that was used as an example during our free outsourcing webinar we had with Pete Williams. 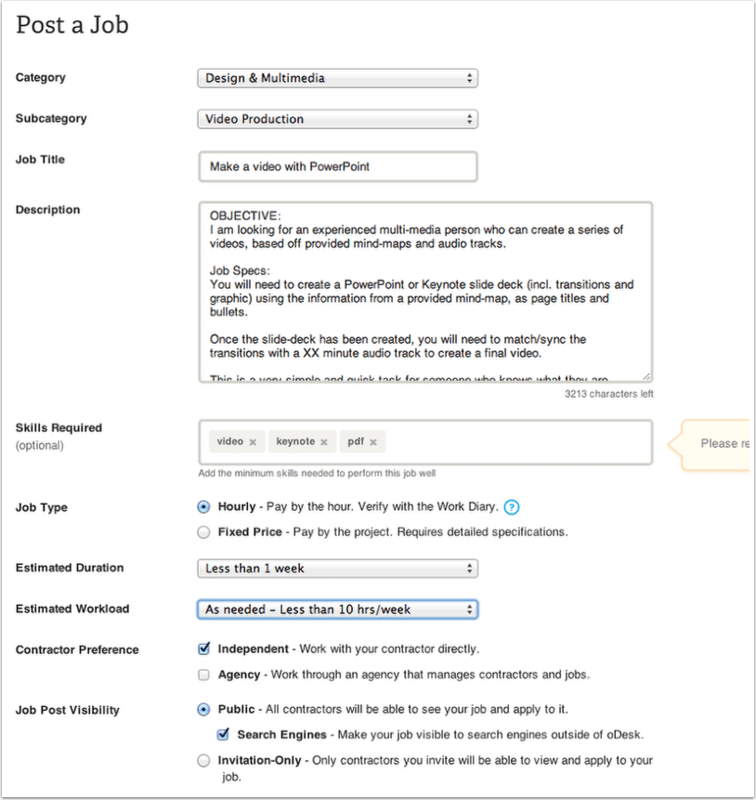 It's a great template to use, and I recommend that you mimic it when posting your first job (go to minutes 25-31 of the webinar to see the template). After you post a job, a screen will show up and ask you to invite folks to your job. 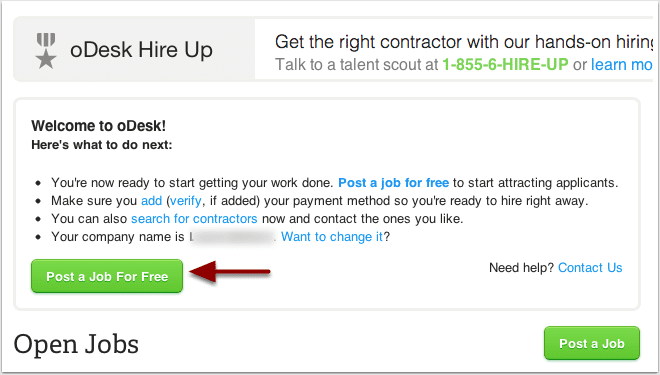 This part isn't mandatory, it's just oDesk trying to help you find good people to hire. You can either send invitations to somebody on that list, or you can just skip it. 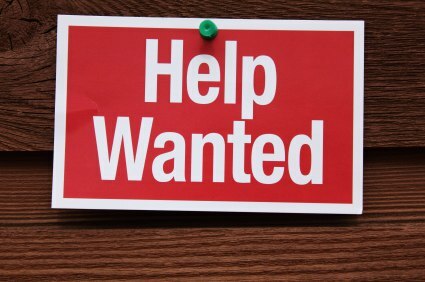 After you post a job, contractors with the skill sets you indicated will be applying to your job. You'll get an email notification that says, "Congrats! You received an application..."
You can go into oDesk and check your job posting to scan through the applicants. I've had anywhere from 5 to 40 applicants apply within 10 minutes of me posting a job. For some jobs I've had over 100 applicants. After you check out the applicants, you can find one that fits the requirements and either put them on your shortlist, send them a message, or hire them. I've been able to hire for jobs that charge as little as $1.25 an hour. Sometimes the work is fantastic, and sometimes it's just okay - but this is all part of the learning experience. You'll learn how to hire A-players, and you'll know how to conduct follow-up interviews/communications so that you can weed out workers who aren't a good fit for your project. What you'll find is that a lot of the time, if somebody doesn't perform well, it's your own fault. If a job goes wrong, ask yourself, "Was I crystal clear in my instructions? Did I hire somebody who wasn't a good fit? Did I put in the wrong key words?" Process design and documentation becomes incredibly important. The better your design and documentation, the more likely you'll get great results. After some practice, you'll get some really solid processes down. At that point, you'll be able to start looking for more permanent workers to start performing work for you. Once you get others to take responsibility for entire jobs, that's when you can really just let go of the mechanics, and your business's potential for growth will increase dramatically. If you want to build a business you can't do it alone - you need help. If you have unlimited funds then this is really pretty easy. But if you're a small to medium size business that is bootstrapped, then sometimes it seems like getting help is impossible. But it's not! Getting help in today's global market is incredibly cost effective if it's done right. What recommendations do you have for out-tasking? *Full disclosure - this is an affiliate link. We bought the course and thought it was great.